I'm so excited to share my new living room with you. Please come in! 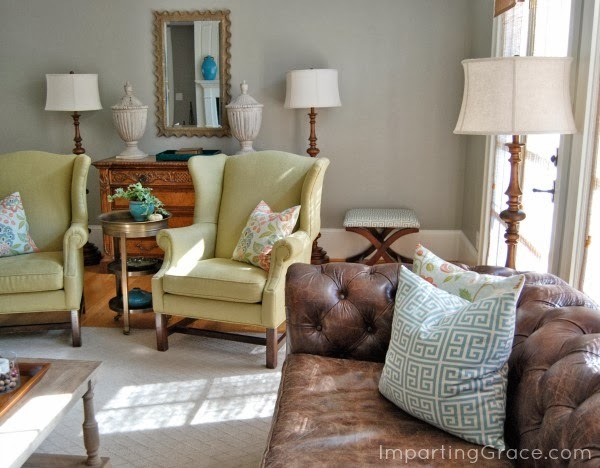 I shared a glimpse into the room during my Fall Home Tour. At that time I didn't have things finished up enough to share the whole room then. The truth is, it's still not finished, but I've accepted that it's not going to be completely finished for awhile. And it's finally finished enough to share! This room is tricky to work with. It's a large room, but it has six French doors and windows, three built-in bookcases, three doorways leading into other rooms, and a fireplace. With all that, there's only one solid wall in the room! 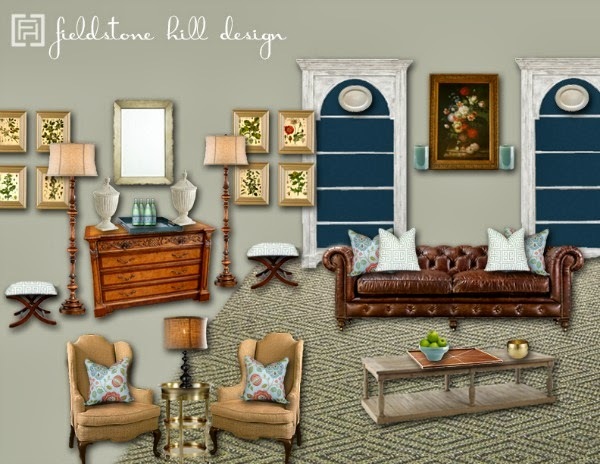 Darlene was able to see past all the challenges and design a floor plan that works with the room's difficult layout. 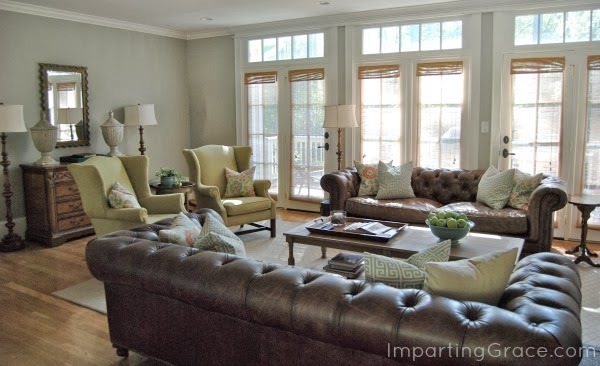 I'd always loved the idea of having twin sofas facing one another, but I never thought it would work in this room. Darlene made it work! The room still isn't completely finished. The right artwork for the end wall has eluded us so far. But it's not hurting us to live with some blank space while we wait. Click here to see all the details and sources! It looks terrific... its all ready for its holiday decor and for the fun to begin. 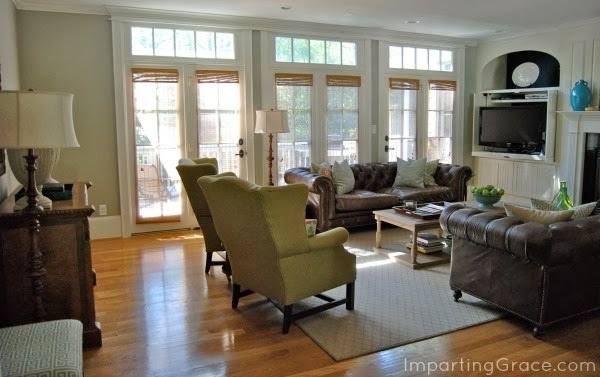 Richella, your living room is gorgeous! I love the colors; and it feels so warm and inviting. I can imagine it all decked out for the holiday season! Don't you love it when a plan comes together! You did a great job executing the design! 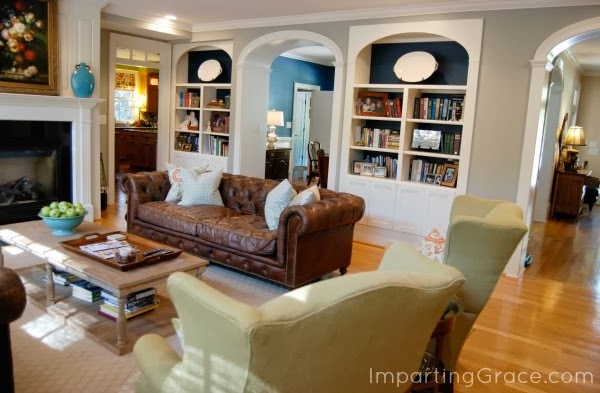 I know that you and your family will enjoy using this beautiful new room! Very charming! Those 3 floor lamps, are they Better Homes & Garden? They do look familiar. Richella! I am so thrilled at how you pulled all of this together! It was a joy to work with you, and meet the needs of your family. I pray that you will fill this room with joy and memories and lots of laughter! HI Richella! 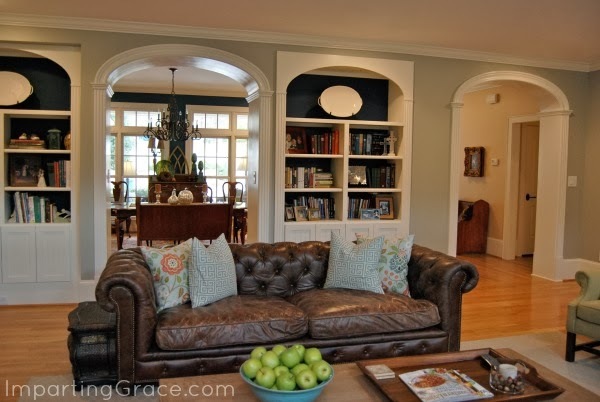 Oh, your living room looks gorgeous! Your home is so beautiful. Hope you and your family are doing well. It's absolutely beautiful, Richella! 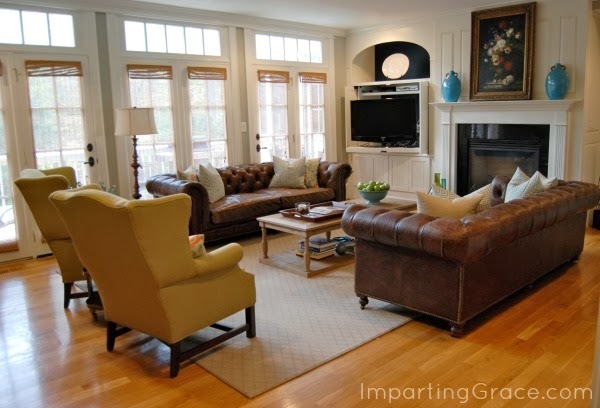 I really like the two big sofas facing each other, and I adore floating furniture when you have the space to do that and you definitely do. Wonderful! 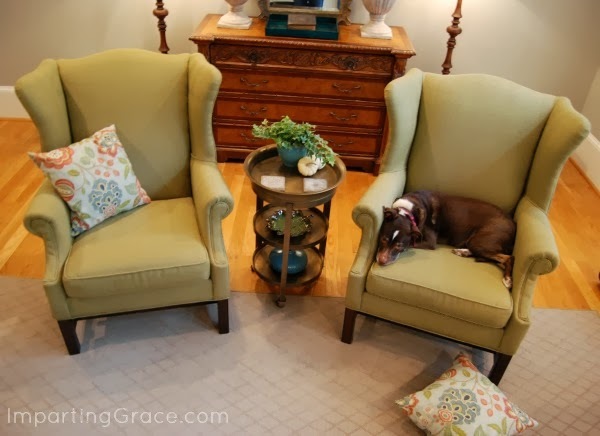 Gorgeous, gorgeous, gorgeous...I see there is still someone out there who like symetry :) I especially like the way the pup knocked the pillow off the chair so he could lay down...happens all the time at my house! It looks lovely, Richella! 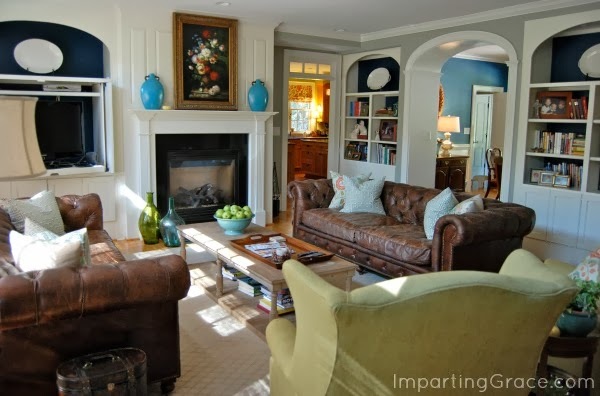 I love the two sofas facing each other and the pops of blue on the mantel. 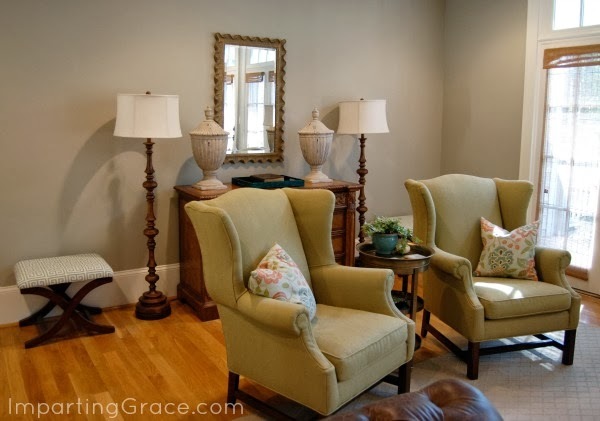 I also adore that little table between the two wing chairs. So pretty! I love it. I also absolutely love the leather sofa. Oh my word!!! Richella this is an absolutely gorgeous room!! It makes me traditional style lovin' heart go pitter-patter. 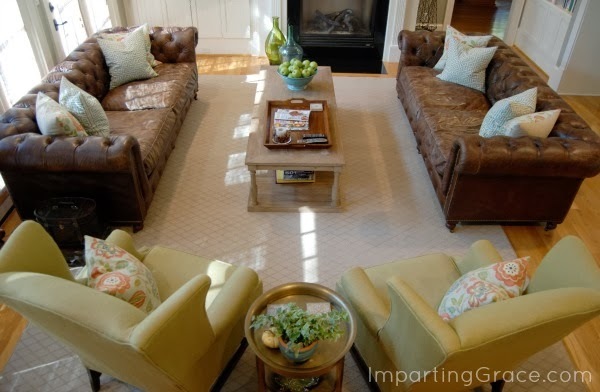 :-) The sofas are fabulous and it has a timeless and classic yet still so fresh feel to it! And most of all, it is warm and welcoming and reflective of it's owner. Beautiful Richella! It feels so warm and welcoming! Hope you truly enjoy it............a great hub of the home. Richella, I love it. I want your sofas. Art is so hard to choose, but it is good to wait till you find the perfect pieces. 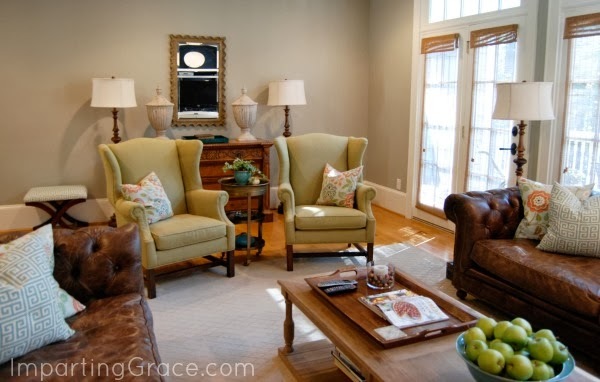 Just stunning!….and I love the wonderful size of the room…such a beautiful room to gather in!….and Darlene is such a great talent!…I so love traditional spaces!!! Gorgeous Richella!! Love the colors! Every last detail is just perfection! Wow it's beautiful! I was recently wondering if I had missed the reveal. 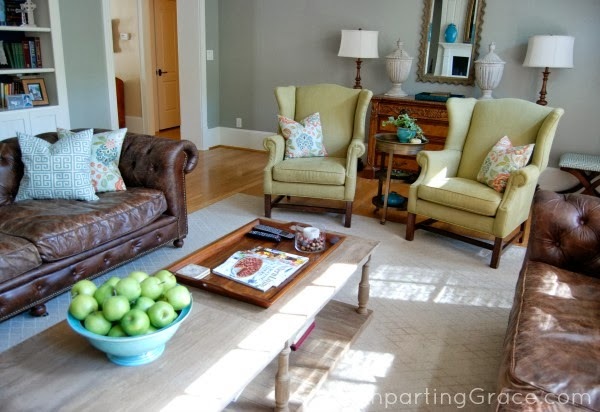 Love the facing couches and they are so practical but lovely for a family. It's beautiful Richella! It gives such a welcoming and cozy feeling. I can picture you getting cozy with a good book, a throw, and a cuppa. How nice have been able to work with Darlene. You too made a great team! Congrats on a room so well done!! I love the new look. Large room but it looks very inviting. 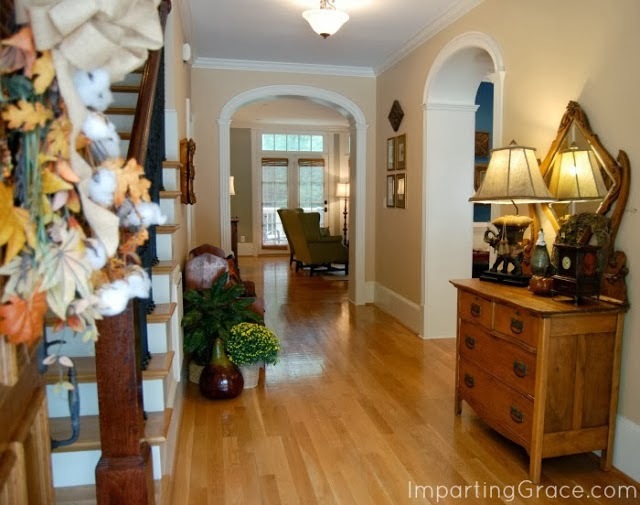 Can't wait to see it all decorated for the holidays! Absolutely Beautiful! You did an amazing job. 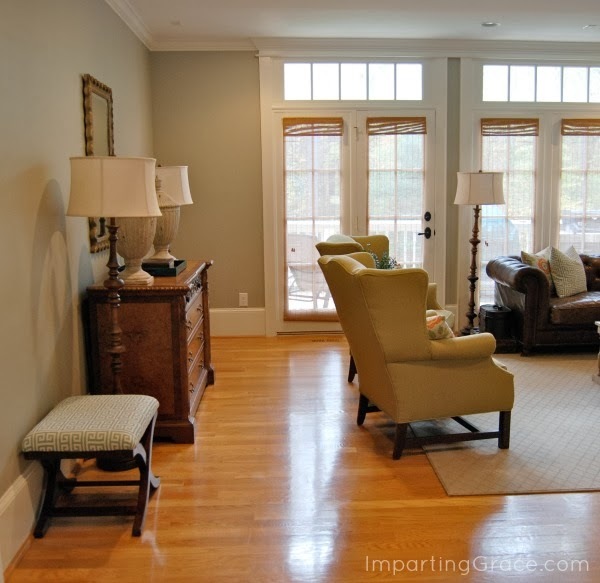 Those gorgeous windows bring true character to the room. Thank you for the inspiration. Come check out my blog at Maddiebellahome.blogspot.com when you get a chance. I look forward to visiting you again for more inspiration. Just became your newest follower. It's beautiful, Richella! Thanks for sharing! That is a gorgeous room! I love all of the color choices.